Odds-on favourite Wyatt’s Town persevered in a hard-fought stretch duel to extend his win streak in Sunday’s featured $100,000 Ontario Jockey Club Stakes for three-year-olds over six furlongs at Woodbine Racetrack. The Norm McKnight trainee set early fractions of :22.52 and :45.05 with Hemp Hemp Hurray stalking throughout before that rival launched his attack in the stretch. The top pair battled head-to-head down the lane with Wyatt’s Town digging in to score by a neck in 1:09.52 and earn back-to-back stakes titles. Once again, Eurico Rosa Da Silva was aboard Wyatt’s Town, who had sprinted out to a quick four-length lead en route to victory in the six-furlong King Corrie Stakes on July 28 at Woodbine. Wyatt’s Town remains perfect in three starts since being claimed off a May 17 winning effort at Churchill Downs for $50,000 by Henley Thoroughbreds Ltd. and Newtop Stables. Prior to his four-race winning crusade, the Speightstown-Natural Rush colt was a runner-up twice and earned four third-place finishes while racing stateside. In 10 career starts, he has banked more than $219,000 in purses. Following his successful Woodbine debut in the King Corrie, Wyatt’s Town was sent postward as the 3-5 favourite and paid $3.30 to win and $2.10 to place. There was no show wagering. Second choice Hemp Hemp Hurray ($2.20 to place) completed the exacta worth $5.90. Supplemental entry Driven by History rallied wide from the back of the compact field of five and closed within two lengths to complete the trifecta, which returned $13.85 for a $1 ticket. Captain Thunder, completing a $52 superfecta, and Run Away rounded out the field. 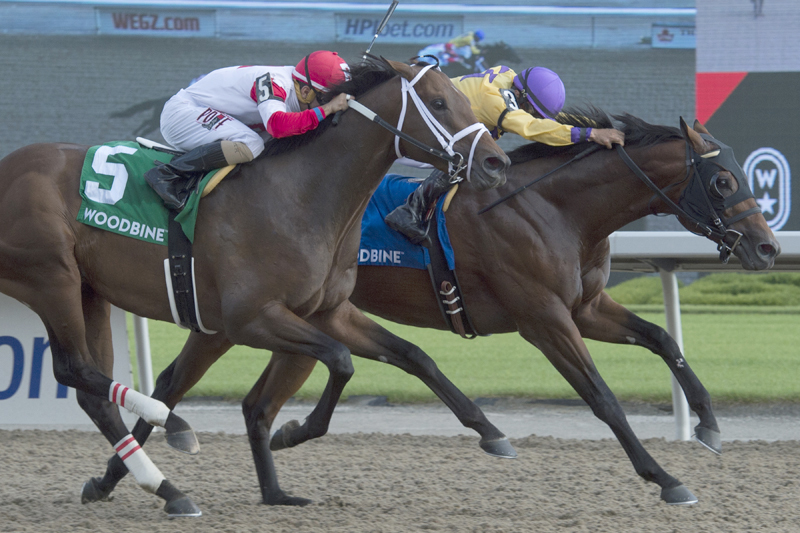 Live Thoroughbred racing continues at Woodbine on Monday afternoon. First race post time is 1 p.m.